As architects, designers and facility managers seek to transform traditional educational location facades into dynamic, vivid communication mediums, they have increasingly turned to digital solutions. Dynamic, interactive façades work well in large-scale applications and can cover sizable existing surfaces while decreasing the use of electricity compared to traditional electronic billboards. Plus, thanks to a high level of transparency, these façades allow for natural daylight and ventilation to reach the buildings surface. This makes it ideal for libraries, student centers and multipurpose buildings that seek to provide a positive interior ambiance and a transparent connection with the outside world while reducing their running costs. Primarily made of stainless steel metal fabric, media façades feature the fundamental qualities of woven metal – durability, aesthetics, transparency, flexibility and security – with unprecedented artistic and communicative capabilities. Here at GKD, we’ve partnered with industry leader Daktronics to develop high quality, durable and reliable LED solutions. Their expertise and products help us create the impressive flexibility and image quality that has made our MediaMesh one of the leading dynamic communications mediums for the A&D community. Below we’ve compiled three of our favorite MediaMesh projects that have revolutionized the way people live, work and play in educational settings. Because of its unique design process, design flexibility, performance and wow-factor, MediaMesh has been making appearances on college campuses and university buildings around the country. The Virginia Commonwealth University (VCU) James Branch Cabell Liberty project is a shining example. Covering a total area of 400 sq. 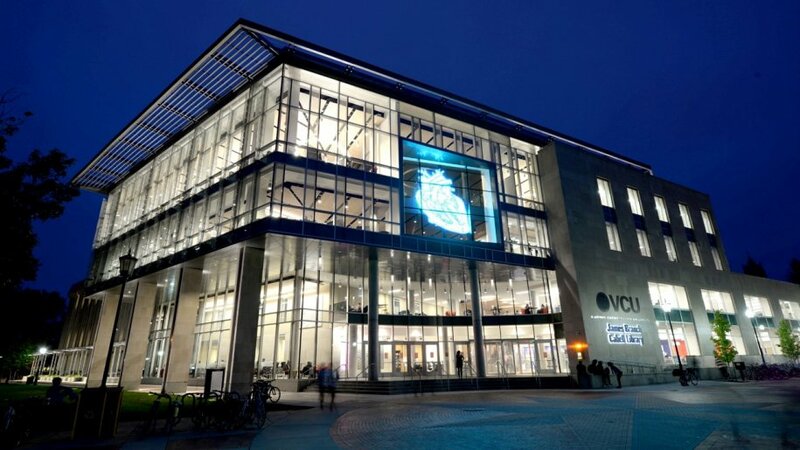 ft., the transparent media façade at VCU is composed of two panels, each measuring 19 x 10.5 feet. The rigid panels are attached with woven-in-bars and eyebolts for a seamless appearance. The installation team had to develop specialty equipment and lifting systems to work around a functioning library. The fourth floor, where the MediaMesh install took place, was a private, no-noise think tank for doctoral students. To respect this need for sound control, we were able to work around the library and students’ schedule through smart planning and effective systems. The North Carolina State University (NCSU) Talley Student Center features a flexible façade serving multiple purposes for the campus. Since the Talley Student Center was new construction, it allowed the GKD team to work with the architect and general contractor from the concept stage through final installation and quality check points. Three exterior panels join together to create a 565 sq. ft. façade over the existing curtain wall of the student center. Attached using woven-in-bars with eyebolts top and bottom, the installation is the only flexible, transparent media façade on campus. This allows students inside the building to have uninterrupted views of the expansive university quad while the screen seamlessly blends in with the architecture of the building. The NCSU project utilizes MediaMesh to foster community engagement. Not only can students watch movies on the 18’ x 32’ ft. screen from the grassy quad, it also provides important safety announcements and news updates. Featuring a MediaMesh façade, the Arizona State University (ASU) Center for Law & Society’s Downtown Campus installation is designed to welcome students and visitors alike. Together, the MediaMesh and Tigris products act as fall protection as well as the main media system. These products combined cover 7,000 sq. ft. of the building, with MediaMesh accounting for 760 sq. ft. of the installation. Like NCSU and VCU, the products help create transparency that lends itself well to the overall design aesthetic of the building, providing a nod to the critical need for transparency in the field of law and criminal justice. With the growing trend of broadcasting live images and video, students and visitors can enjoy the visual impact in what would otherwise be a static space. From conceptualization to installation and beyond, GKD is an asset that brings a wealth of knowledge and experience to projects big and small. GKD representatives work directly with general contractors to streamline the installation process. In a world where timelines and budgets matter, our dedication to excellence helps alleviate stress and provides GC’s and subcontractors with peace of mind. See MediaMesh in action here.